Let your yoga take flight and swing your way into feeling fit while having fun! Aerial yoga combines all the benefits of traditional yoga- flexibility, strength and balance – with the unique conditioning of aerial dance and acrobatics for an exhilarating new way of approaching yoga. Sculpt your body in the air, using our special yoga swings, as you tone muscles, find balance, and increase flexibility. 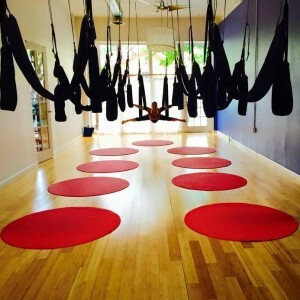 Aerial Yoga Play allows a combination of benefits similar to aerial yoga, pilates, suspended resistance training, acrobatics, and aerial silks all rolled into one for an amazing suspended fitness experience. 12 yoga translations- stretches & variations you can teach effectively to your clients/students. 55 restorative and therapeutic exercises/variations using all the equipment. Safe in’s & out’s of the yoga swing and other equipment. Various secure holds, anchors, and locks in the yoga swing. Proper postures for safe lift-off and maximum fun! 8 Dynamic and Acrobatic Movements for more advanced students, strength, and agility in the air (advanced training only).